Leh, a high-desert city in the Himalayas, is the capital of the Leh region in northern India’s Jammu and Kashmir state. (I didn’t know how to start the blog so after a lot of thought process, I copy pasted the above from wiki). Now let me go over how I planned for the trip. In this post I am trying to cover almost everything that will be required to plan a trip to Leh. After consulting with our respective managers we decided on the date of the trip to be May 26th to June 7th. That was 9 working days + 2 weekends. To reach Leh, you either need to take a flight directly to Leh or reach by road from Manali or Srinagar. The return flight ticket to Leh costs roughly INR 30K per person from Bangalore with a transit in Delhi. So we ruled that option and initially booked the package for Manali-Leh-Manali which came to INR 30K per person for the 10N/11D trip all inclusive. The plan was to fly to Delhi and then take the bus to Manali. Here is when we were hit with the ground reality. 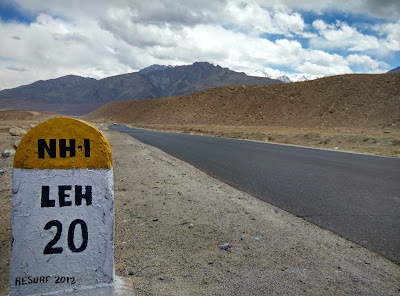 The road to Leh is closed for most part of the year. These roads are usually open for traffic from May to September. You can check if the routes are open on leh.nic.in. The Border Roads Organization (BRO) that maintains the roads was yet to open the Manali-Leh road for traffic. We were told to reconsider the travel dates which was not possible because syncing vacation of 5 people was not so easy. The Srinagar-Leh was already opened for traffic and the quote for the 10N/11D was INR 32K per person (incl Breakfast and Dinner). For INR 2K extra we got the option to do the complete J&K border road trip and we changed our package to this one. An interesting issue came up when booking flight for Bangalore-Delhi-Bangalore route. 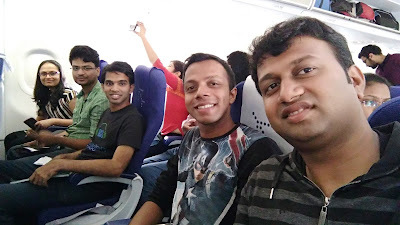 The initial plan was to book the 9am flight from Bangalore and 5pm bus from Delhi to Jammu. The round trip cost to Delhi was INR 8.4K and we were booking 2 weeks before our travel date. Since we were booking 5 tickets, the dynamic pricing of airlines increased the final price to INR 11K per ticket (plus add the INR 350 booking fee per ticket that was never mentioned when we started our booking). All this resulted in changing our flight to the 2:40pm one where we got the initial cheaper fare. But this brought in a new problem. All outstation buses leave Delhi by 7pm and the last Volvo to Jammu was at 8pm from Majnu ka Tila. This was a tight call as our scheduled landing time in Delhi was 5:30pm and this pickup location was 25kms from the airport. The good thing about Delhi is the Metro. We scouted for metro routes. The best way to reach Majnu Ka Tila which is the boarding point for almost all outstation buses is to take the shuttle to the Airport Link metro station (15mins) and then change to the yellow line in New Delhi Metro Station (25mins) to reach the Vidhan Sabha metro station (10mins). You then need to take an auto or electric vehicle to reach your boarding point. Once we had this figured out, we booked the Volvo to Jammu for INR 1400 per person. The Volvo from Manali to Delhi cost us INR 1000. While we are talking about transport, I would like to point out that there are trains from Delhi to Jammu but unless you are booking a month in advance or by tatkal, it’s hard to get a confirmed ticket. There are no trains between Jammu and Srinagar now but as per the Railways, the laying of track is in progress and half the route is open with a few trains already operational. I couldn’t find information for direct buses between Jammu and Srinagar online. You could also fly to Srinagar to start your trip and flight would be relatively cheaper than the flight to Leh. Once all this was booked, came the next step. What to carry? Sathya Bhat, whom I met on twitter gave me some very important tips. Leh is at an altitude of 11000 feet and the temperature is between 1 to 15 degrees in summer. This climate doesn’t actually need thermals and you can manage with a good jacket or sweatshirt. But you can carry one set of thermals just incase you feel feverish or cannot handle the cold. I was covered in layers (A full sleeve tshirt + a normal tshirt on it + a jacket) whenever we went on the snow. Use gloves when you touch or play with snow. Though the climate is cool and breezy, the sun is harsh. So sun screen and lip balm is a must to prevent sun burn. Also a pair of shades since the light reflected off the white snow/hills will make it difficult to open your eyes. And carry deodorant as you may not be in a mood to bath everyday (just saying). Due to the altitude and lesser oxygen in most places you could get altitude sickness. So carrying Diamox is recommended. Also if you get nauseated or have motion sickness then do carry medication for that as well. None of us needed to take this but it’s good to have it on you. Carry cotton to close your ears if you don’t plan on carrying those monkey caps or mufflers. Carry water bottle and drink in small quantities throughout the day. As for other accessories, a power bank is recommended as the battery drains fast in cold temperature. 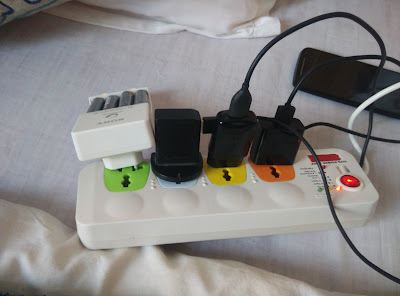 Places like Nubra and Pangong run on generators with limited power only at night, so you can carry a LED light/torch just in case and also a spike strip will come handy when you have only one charging point and multiple devices to charge. You will be on road for hours, so if you are very particular about kind of music you want to hear then carry a USB with your favourite travel tracks. Most places only accept cash, so make sure you have sufficient cash on you at all times. ATMs are available in Leh but you will hardly find it in other locations. Please note that prepaid mobile numbers do not work in Leh. You should either carry a post paid number (preferably BSNL or Airtel) or you can buy a sim card in Leh with one month validity for around INR 300 depending on your 3G/Voice requirements. 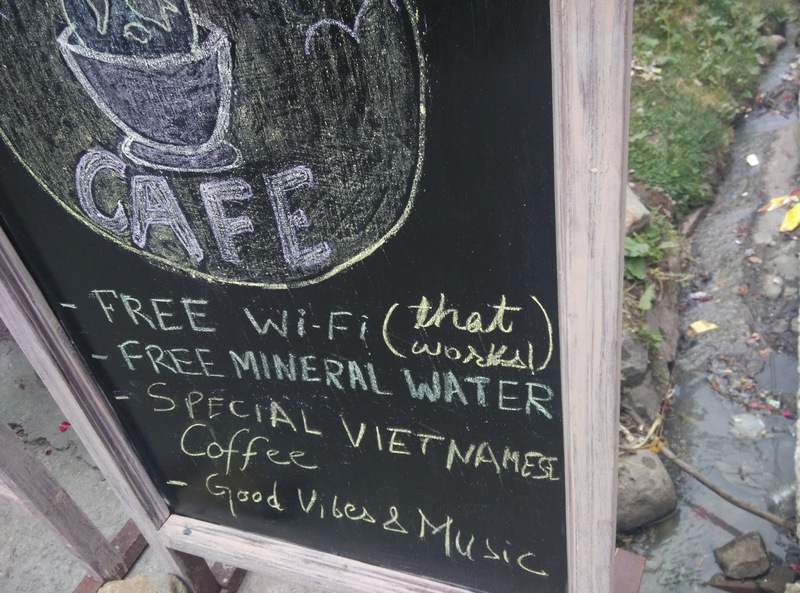 Most places offer free WiFi but they are so slow that you would prefer not having connectivity. Leh has a lot of café’s and offers almost every cuisine from India. So food will never be a problem in the city. However when you are on road you may not get best of the food. Maggi and omelette will come to your rescue at such times. Carry some biscuits because trust me you will need it. The yellow board vehicles and zoom cars from outside Leh will not be allowed to commute to the places within the Ladakh region. I heard the same about bikes but I did see a few bikes with outstation numbers. So if you get a cab from Manali or Srinagar then it has to be grounded and you will need to rent a JK-10 yellow board vehicle to goto Nubra, Pangong or such places. It would be a good idea to rent bikes once you are in Leh if you are interested. 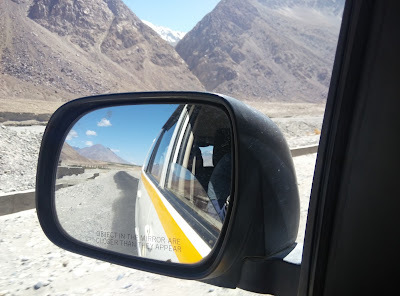 This occurred to us after we had completed payment and were returning from Leh. The bike rentals in Leh will cost you between INR 1000 to INR 3000 per day (fuel extra) depending on type of bike you rent. If you visit the Leh market then you will see car-pool or shared taxi options to commute to places. So if you are traveling solo then worry not, there are enough places you can find to share a ride. Probably I should have started with this, but if you hate road travel then you should probably not visit Leh. Roads don’t exist in most places and it takes long hours irrespective of distances. But the scenic routes totally makes up for it. Below is the routes I took and the time it took me to cover the same. And there tends to traffic jams in those routes so it might take more time. 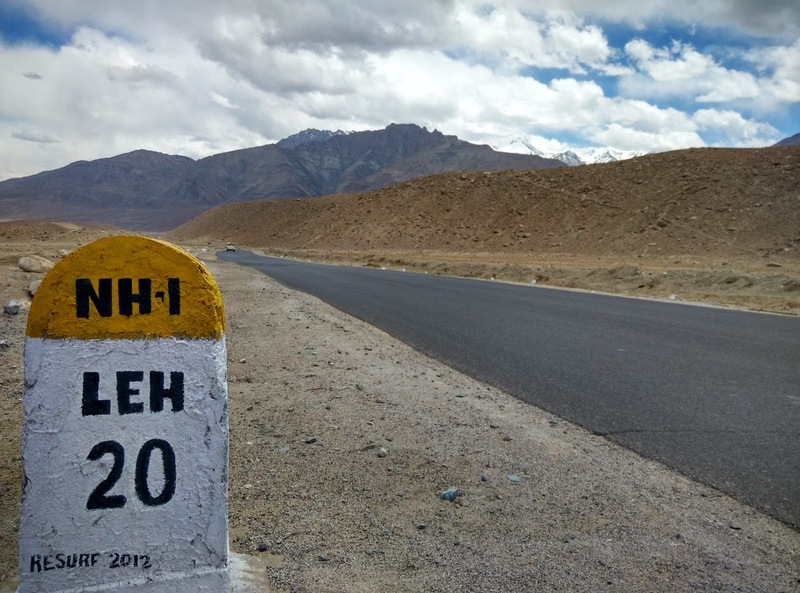 Once you reach Leh, you will need a minimum of 5days to cover the major places. One day for local sightseeing, 2 days to cover Nubra (with sufficient rest), 1 day for Pangong lake and 1 day for adventure activities such as rafting or mountain climbing. There are a lot more valleys that you can cover for which you can plan your stay accordingly. Well that’s about it. A high level view of how to plan a trip to Leh. In my next post, I will cover the routes and places to visit in detail. If you need any additional information do leave a comment and I will be glad to answer. In case you have been to Leh and feel that I have missed some details, let me know so that I can update the same.